Wishing a warm welcome to all our new Fulbrighters. 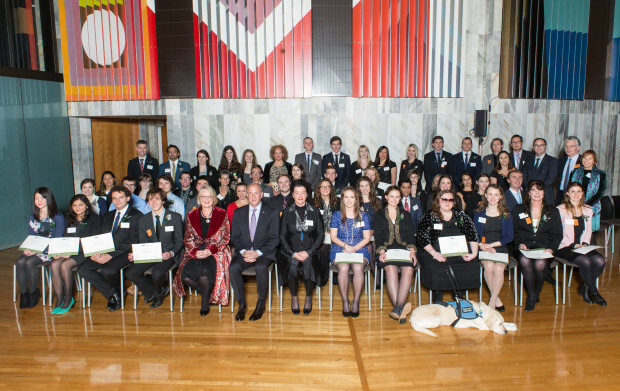 Pictured here are all the grantees at the 2015 Fulbright New Zealand Awards Ceremony and Alumni Reception at Parliament in Wellington, where they were presented their award certificates by the Hon Chris Finlayson, US Ambassador Mark Gilbert, Fulbright New Zealand Chairperson Helen Anderson and Fulbright New Zealand Executive Director Penelope Borland. Full details of everyone awarded a grant from Fulbright New Zealand this year, including all those unable to attend the ceremony, are available here. Welcome to the Fulbright family!